Lisa is Bossy: Happy St. Patty's Day to me! OK so it's not really Irish. Nor green. Nor St. Patrick's Day themed. Nor did I even complete it today. But I finally have a knitting post to enter here and thought it might be nice to coincide with a holiday! Happy Saint Patrick's Day to ya! I had my corned beef and cabbage on Saturday - did you get yours? For St. Patrick's Day - I wore green! And modeled 2 styles of my most recent knit goody! I haven't done any knitting since I completely OD'd on all these purses I made for good girl-friends last Spring. The thing is, most of the work involved in those purses was assemblage and not knitting; but I was still fried anyway. So I took a loooooong break. I couldn't bring myself to cast anything on until just last month. That's a full 11 month long break! 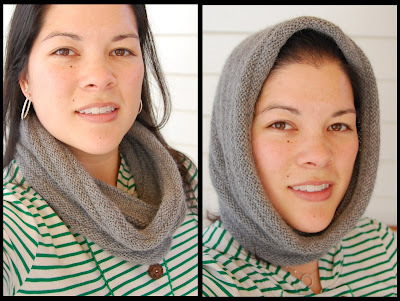 I wanted to make a neck cowl last year and even tho it'd be a very simple knit, I never did it. I found my fingers itching to pick up the needles again this winter and thought I'd better hurry and get this cowl made before the cold weather is no more. Just in time! I've worn it 2-3 times now and it's been just what I needed on some brisk March evenings! In Eco Alpaca by Cascade Yarns - I only needed a skein and a half (if even that entire half). I used size US6, 16" circular Addi Turbos, my FAV-OR-ITE needles. Easy-peasy knit. The pattern calls for a lot or purling, which I don't love doing...so I knit it backwards and got to do way more knitting instead! The thing that's cool about this pattern is you can really wear this knit a few different ways. I've thrown all 4 (5 if you count the hat) ways up here for you to see. Note - all the photos with my green striped St. Patty's Day top are there to show the different styles.